Exercise is good for us and helps with depression, anxiety and a host of other ailments. Yeah, yeah. We’ve heard it all before. So what’s new? What’s new is a recent study, reported by the New York Times, that shows that where you exercise may be as important as when you exercise. Many, many moons ago I use to get up at five a.m. and run five miles nearly every day. Most of my runs were in an older part of the city where I lived, which had lush, tall trees and serene parkland throughout. There was even an old cemetery with beautiful landscaping that I would cut through. In addition to losing a significant amount of weight, I felt better mentally too. At one point I decided to push myself a little harder and believed it would be best to measure my exercise and its progress. I stopped my runs through the neighborhood and began running around the track at a local high school football field. Briefly my speed and distance improved, but I wasn’t getting that same exhilaration I was used to getting. Within three months my running days were over. What I didn’t know at the time was that it wasn’t just the exercise that was putting me in a right frame of mind, it was being in natural space. I didn’t know that being one with nature was having physical effects on the brain as well as the body. Gregory Bratman, a graduate student at the Emmett Interdisciplinary Program in Environment and Resources at Stanford University, was studying the psychological effects of city life and found volunteers who walked through greener portions of Stanford were more attentive and happier afterwards than volunteers who walked the same amount of time near heavy traffic. Intrigued by the results, Bratman chose to study further. He wanted to know if being with nature has a neurological effect. Does it actually change our brain in some way? He and his colleagues needed a way to measure their results and determined that brooding may be the way. As part of the study, thirty-eight healthy adults completed questionnaires to assess their normal level of brooding. In addition, researchers checked for brain activity in an area called the subgenual prefrontal cortex. Then half of the volunteers walked 90 minutes through a parklike portion of Stanford. The other half walked next to a multi-lane highway. Immediately after their walks, the volunteers repeated both the questionnaire and the brain scan. The volunteers who had walked through the park-like area showed improvements in their mental health, according to their scores on the questionnaire. They were not dwelling on the negative aspects of their lives as much as they had been before the walk. They also had less blood flow to the parts of their brains that were measured. Their brains were quieter. Thirty-eight people may not sound like many, but it’s a start. Until further studies validate Bratman’s results, what’s the harm in taking a leisurely walk through the park? Maurice and I try to walk together weekday evenings to get some exercise and spend time together. Saturday, however, is the time we really get to enjoy each other’s company. While much of that is spent relaxing in the afternoon at Starbucks, we are slowly getting in the habit of some morning exercise. 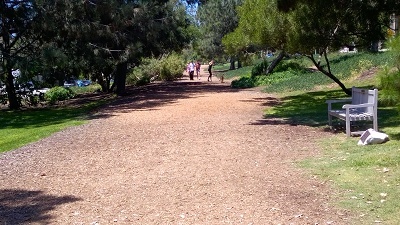 The photo up top is a trail through nearby Hermosa Beach. We like to start our walk there until the pathway ends. When the path ends we walk about ¼ of a mile over to the beach and head back to our car by strolling along the strand. 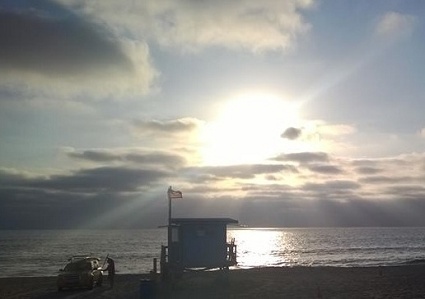 The beach picture above is one I took while on Hermosa Beach. Granted, we’re not filling out questionnaires regarding our broodiness, nor is anyone measuring our brain activity, but, I’ve grown to look forward to our Saturday walks. For a little while, at least, they do help calm me and give me peace of mind. Give it a try. ← Is It Depression or Is It Just Depression? In the south bay, which is one big grid, there are so many ways to drive to get where ever you wish to go. I always pick the streets with trees for just that reason. Driving by shopping strips is depressing; driving through green is rejuvenating. We stopped watering our front and back lawns because of the CA drought. We’re saving an incredible amount of water, but looking at your yard is no longer such a pleasure and that does make me sad. Excellent advice that anyone can try!